NOTE: The contents of this article apply only when making changes to an active time off policy (not draft policies). 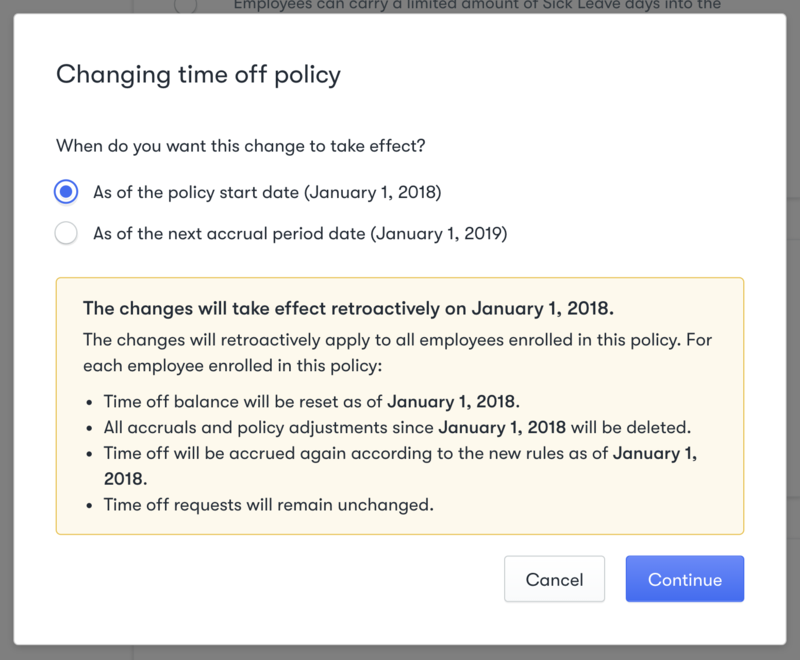 When making changes to the rules of an active time off policy, Collage gives you the option to choose how you want the changes to be applied. You will be given a choice between applying the changes retroactively from the policy start date or as of the next accrual period. Choosing to retroactively reset the policy will reset the balances of everyone in the policy back to the most recent year start, and re-accrue up until the current point in time based on the updated policy rules. This essentially makes it so that the balance history will read as if the new policy rules had been in place since the beginning of the current policy year. Deductions from time off requests and manual adjustments will not be affected by this reset. Example: Your policy is set up with 15 vacation days per year, accrued at the beginning of every month, with a policy start date of January 1st and an annual reset. This means employees under this policy accrue 1.25 vacation days at the beginning of every month. In February, you discover that the policy should actually be 20 vacation days per year, not 15. 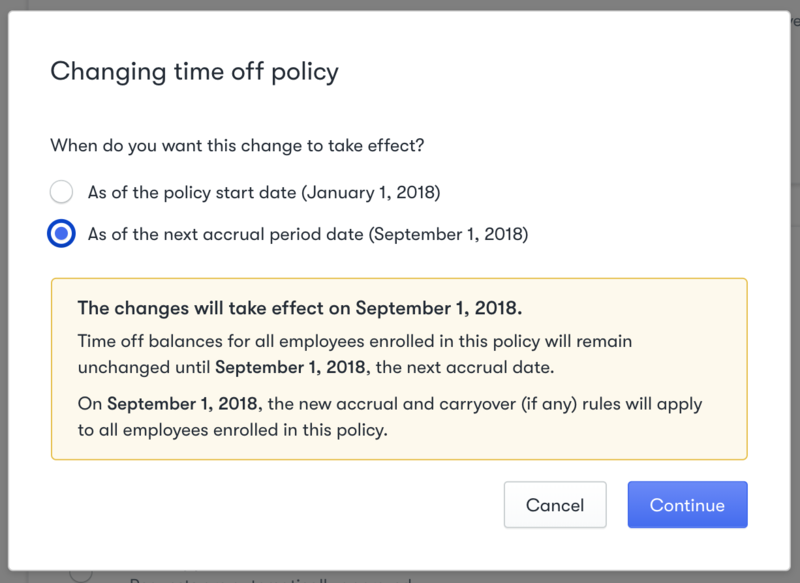 When you go to update the vacation rules for this policy, you change the number of days per year to 20 and select "As of the policy start date". The accrual history for employees in this policy will now reflect the accrual rate of 1.66 vacation days per month since the beginning of the year. Choosing to apply the changes as of the next accrual period will only begin affecting accruals on the accrual date of the next period (this date may differ from the policy start date if accruals are not earned annually). From then on, accruals will occur based on the updated policy rules. Example: Your policy is set up with 15 vacation days per year, accrued at the beginning of every month, with a policy start date of January 1st and an annual reset. This means employees under this policy accrue 1.25 vacation days at the beginning of every month. In August, your policy rules change and employees in this policy should now accrue based on 20 vacation days per year. When you go to update the vacation rules for this policy, you change the number of days per year to 20 and select "As of the next accrual period date". At the beginning of September, instead of accruing 1.25 vacation days, everyone in the policy accrues 1.66 vacation days, and continues to do so going forward. 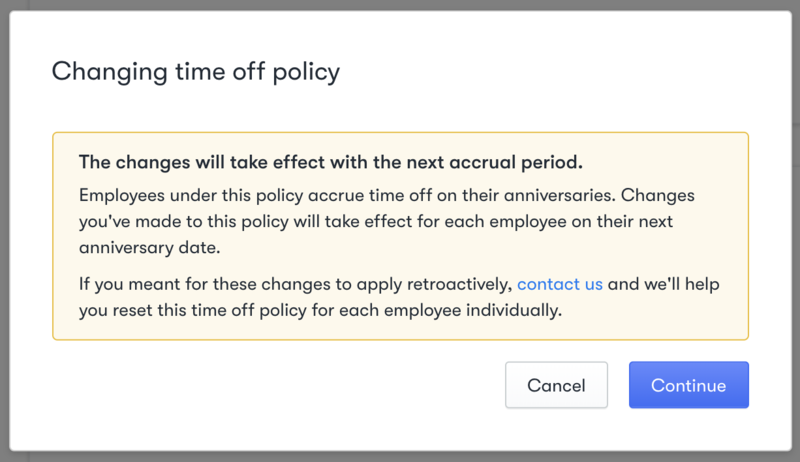 When a policy is configured such that the time off year is based on an employee's anniversary (their start date), then the choices above are not available and changes come into effect on the next accrual period. This would take effect for each employee on their next anniversary date. You are encouraged to contact us directly to apply these changes retroactively.